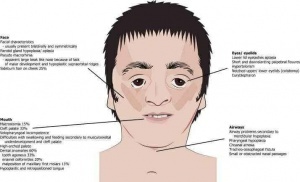 Treacher Collins syndrome (TCS) is a rare condition. Babies who have it are born with deformed ears, eyelids, cheek bones, and jawbones. There is no cure, but surgery can make a big difference. The condition is caused by an abnormal gene that affects how the face forms. Hearing loss is common. A child with TCS may have sleep apnea and/or conductive hearing loss ; the loss of ear function may require a resource to provide child hearing aids. Signs and symptoms vary from almost unnoticeable face changes to severe facial and ear alterations, cleft palate and restricted airway. This condition can make it hard to breathe, sleep, eat, and hear. Problems with the teeth and dry eyes can lead to infections. Life can be hard for people with TCS. The deformities may lead to problems in family and social relationships.